Keep track of your artists' repertoire and when each piece was performed. 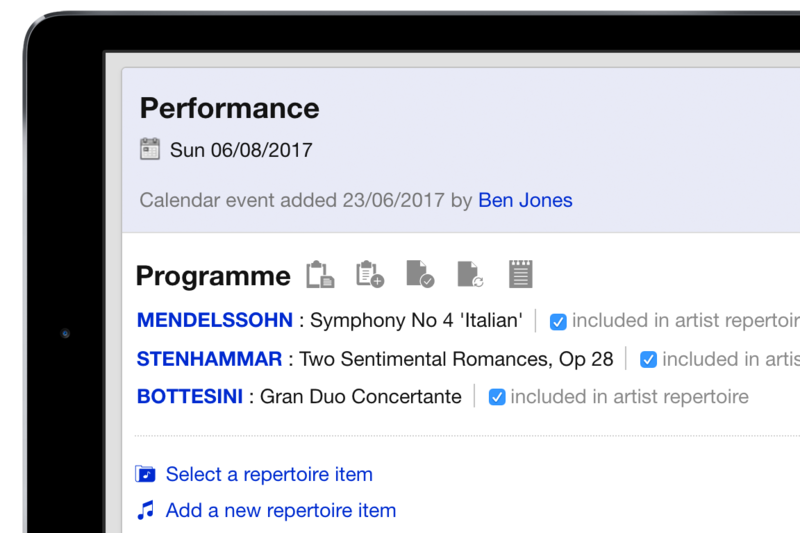 Simple calendar management, add and track engagement periods, rehearsals, performances, travel and more. Share some or all of a calendar with an artist or other members of their team. "Overture has allowed us to manage many important aspects of our work in one place from anywhere in the world. It is an invaluable and very user-friendly resource for the company." "We have been delighted with Overture. It is a powerful yet intuitive package which has streamlined many of our day-to-day tasks, and the support has been excellent. I would thoroughly recommend Overture without hesitation."